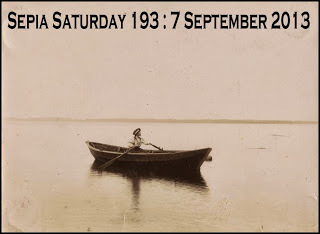 This week’s Sepia Saturday image took me back to the days when my Dad and I used to go fishing off Magnetic Island. Not quite alone and isolated but a sense of being cut off from the world…as evidenced by the fact I have no photos. My image, on the other hand, couldn’t be further from the sea and a boat but it reveals the same sense of isolation: a woman, her dog and her horse in the bush, mustering. Until you pay close attention to the photo. I’m not sure, but I think she’s checking her mobile phone! 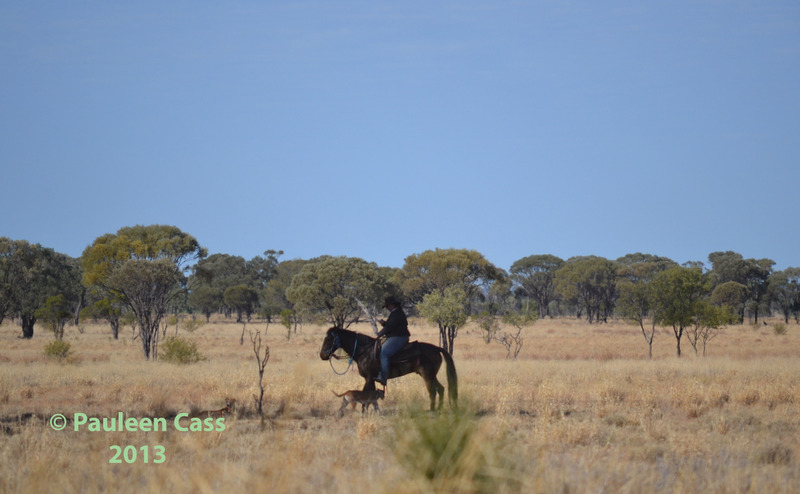 So perhaps not quite so isolated after all, though I’m sure there are plenty of times away from mobile range when she’s out mustering. And just to show images can lie, off to the left is a waiting ute. This entry was posted in Australia, Family History, Queensland, Sepia Saturday and tagged mustering, Outback, Sepia Saturday by cassmob. Bookmark the permalink. A lovely story… we lived beside a lake and often went out in a boat. it really does make you feel isolated, though now when I return, I see the lake through much ‘smaller eyes’. I wonder, is there any household that doesn’t have a mobile phone? It’s funny how placea can seem larger than life isn’t it Chris. Partly the power of memory and partly just a change in our own size. I suspect in Oz, the answer to your question would be pretty few, and many would have multiples. I was tossing up whether to write about my Nanna and her boats, or us three kids in isolation between Mildura and Broken Hill, and in Silverton river bed (dry of course). Australia is a land easy to be isolated in I think. Definitely Jacke, it’s easy to forget in the city,just how wide those open spaces are, and how ften we are out of phone range. Yes, a lovely picture; makes me feel like going some place I might not be found, or found only by a few. It makes me feel large and small, which is good, because we’re both. Yes, it is difficult to be truly isolated these days isn’t it? Mobile phones do seem to be endemic. Even in the good old bush. What must dogs think of mobile phones I wonder? Indeed Alex! And when we aren’t able to be in range we so often suffer withdrawal symptoms. I feel isolated in my own house sometimes, even though I have phones within reach. That kind of isolation isn’t always a good kind. The kind I feel when I’m out of the city and away from people is usually a good kind. I like the photo with the unexpected aspect of the cell phone. I know what you mean Kristin. For me that’s one of the huge pluses of being part of our online community. By the way your postcard is en route…heaven knows how long t wll take to get there.